Welcome to Four Corners Tack! 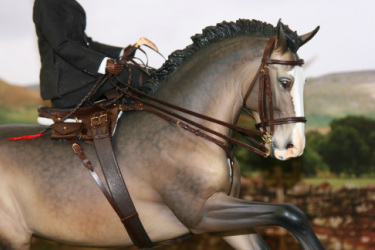 I make fine miniature scale saddlery for model horses, and have done so since about 1998. My work has done well at live shows all over the world, including the United Kingdom, Germany, Finland, USA, Canada and Australia. The name Four Corners is inspired by my interest in horse cultures all over the world, so on this site you will find examples of English, Western, Peruvian, Spanish, Australian and even historical saddlery. I take on a limited number of orders per month, usually 1 or 2, so that I don't build up a big backlog. My techniques are copied or modified from the same techniques used on real saddlery. Certain details may be simplified but wherever possible I will try and copy like for like. I document some processes and talk about my latest work on my blog, and you can join my yahoo group to be the first in line for custom order slots.